Is it okay to exercise with diabetes? How do blood sugar levels affect your feet? How soon should I seek treatment for Charcot foot? How can I prevent Charcot foot? How often should I perform diabetic foot checks? When should I seek medical attention for diabetic wounds? Why is wound care important for people with diabetes? Can I use my orthotics for shoes in any style of footwear? 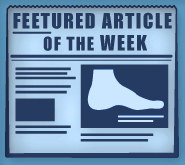 How are custom orthotics different from over-the-counter inserts? Will orthotics for exercise relieve my foot pain? Should a podiatrist check my children's feet? How do I get stronger nails?